Moshi’s VersaCover for iPad mini offers a stylish variation on the Smart Cover with protection for the back of the iPad thrown in. It features a slim design and an origami folding cover that allows for various angles when using it as a stand. 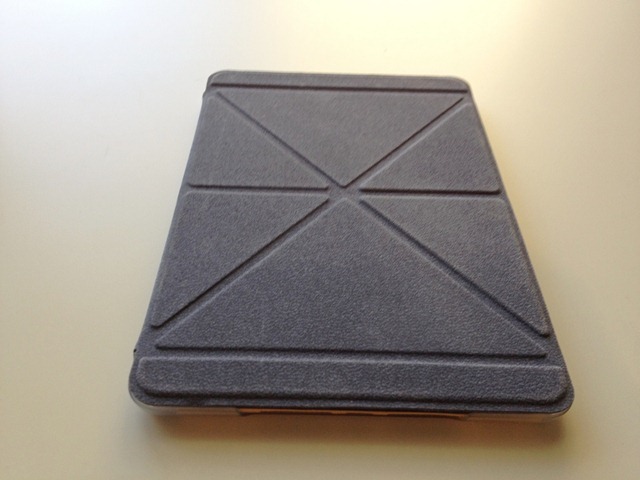 I’ve been a big fan of Smart Covers since the early days of using one with an iPad 2. The Smart Cover for the iPad mini is every bit as nice to have on the smaller iPad. The idea of a minimalist Smart Cover-like case with some back protection thrown in is appealing, so I decided to give the VersaCover mini a look. I’ve been using this one heavily for the last 3 weeks or so and it’s about time for a review of it. The VersaCover is made of a soft microfiber material; there’s a casing that serves as a frame for the iPad to slot into which also protects the back of the iPad against scratches and shocks. It comes in Aloe Green, Sakura Pink, Velvet Grey, and Denim Blue. I have the Denim Blue model. The case is priced at $50.